The following article is taken largely verbatim from "Officials", an article appearing in Kettenhunde: The Newsletter of Feldgendarmerie-Trupp (Mot.) 200, Volume IV, Number 1 (Jan/Feb 1994). The article was authored by LTC Louis H. Brown; minor changes in grammar and organization have been made. The concept of uniformed civilian personnel in the military is somewhat difficult to understand. A particularly European idea, the German Army probably took the idea to its limits in institutionalization. In early European armies, soldiers fought while civilians were hired on to provide certain services. A prime consideration in this was money; armies in the 17th and 18th centuries represented a significant chunk of a state's budget. Services and items needed only for war were an unnecessary expenditure in peacetime, and armies grew to depend on hired civilians for certain items and services. It was usual, for example, to hire civilian drivers and their oxen teams to move artillery during campaigns, sparing the expense of maintaining the animals and drivers at all times. It was not long before an interface between the soldier-commander and these providers became necessary in order to ensure that the commander got what he wanted. In both the French and German armies (and no doubt others as well), the go-between was usually a civilian appointed on a royal patent of authority to provide the army with supply and services. This individual, who gradually assumed the duties associated with what we would call a chief of supply and logistics, was generally afforded a title and a "pecking order" ranking which placed him in a relative relationship with serving soldiers. Comte de Rochambeau (commander of the French forces sent to North America during the War for Independence) had assigned to his suite a Maréchal de camp who was the equivalent of a brigadier general; his uniform, of a distinct pattern and color, nevertheless bore the same rank distinctions as a general officer of equivalent rank. This system, well-entrenched in the German Armed Forces, survived to the end of the Great War. Well-developed in terms of uniforms, insignia, and authority, the officials provided the German Army many of its personnel and logistics services as well as being responsible for most supply and victualling. 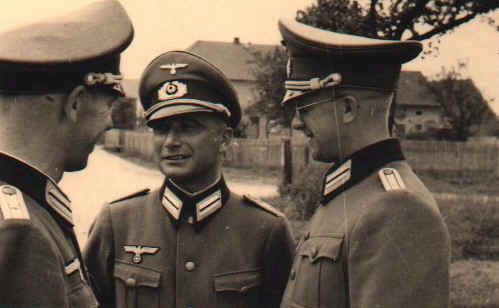 Most officials (called Beamten) ranked equivalent to officers; there were some with equivalent Unteroffiziere mit Portepee (Senior NCO) ranks. They were members of the Armed Forces according to the Law of Land Warfare, but were not "soldiers" by the German definition. As officials, their authority extended only to their specialty field -- unlike soldiers, whose authority extends to anyone whom the individual outranks. Beamten could not hold command. They were entitled to all the customs and courtesies associated with their rank/status, however. In the social order of the day, being an officer was the peak of the pyramid, if you couldn't be a regular officer, being a reserve officer was next best, and a very close approximation of that would have been appointment as an official. In addition to those performing personnel, supply, and logistics functions, army chaplains, doctors, bandmasters and veterinarians were also officials, although their uniforms differed significantly from those of the other officials in being basically those of active officers with distinguishing insignia. The main difference between officer and official status depended much on education. Officials were by no means lesser-educated officers -- many had university degrees (which few officers did) -- but they did not meet the professional education/training requirements for appointment as officers or soldiers. Most officials tended to remain such although if the military education qualifications were met, appointment as an officer or soldier could be made. In 1944 the Germans began to laterally appoint all officials to regular officer ranks; how far this program went is conjectural since it was begun so late. Those taken over wore regular officer uniforms. Several new "branches", with corresponding branch colours and insignia, were created to accommodate these individuals. Many officials, by the way, were Zwoelfender ("Twelvers" -- from the 12-year service requirement), retirees out of the Reichsheer (1919-1935). One of the Reichsheer's member benefits had been retraining during the 12th year of service in a civilian career -- one of the more attractive options was appointment to the Beamtenschule, a training school for government officials which allowed many to come back into the army as civilian administrators. Waffenfarbe - the branch colour for officials was dark green, with specialties further specified by a secondary colour (Nebenfarbe). For General-equivalents, green "flecks" were added to the silver portions of the braid at 1 cm intervals. For Field Grade Officer-equivalents, the silver braid of the shoulder strap had a green line down the middle. For Company Grade Officer-equivalents, a thin green stripe ran between the two rows of silver braid. 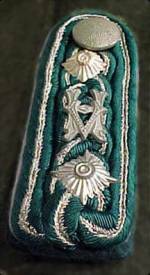 For NCO-equivalents, a distinctive green and silver braided strap was worn. In all cases, a distinctive "HV" monogram was worn. Rank stars were also added to these shoulder straps. Both the monogram and stars were in white metal for NCO and General equivalents, and in gilt for Company and Field grade officer equivalents.The "HV" stood for Heeresverwaltung (Army Administration). As mentioned under waffenfarbe, the shoulder straps worn by Beamten were underlain in dark green waffenfarbe, with a secondary colour in between this underlay and the actual rank insignia. Field clergy did not wear shoulder straps. Beamten were not addressed by the same titles as regular officers. 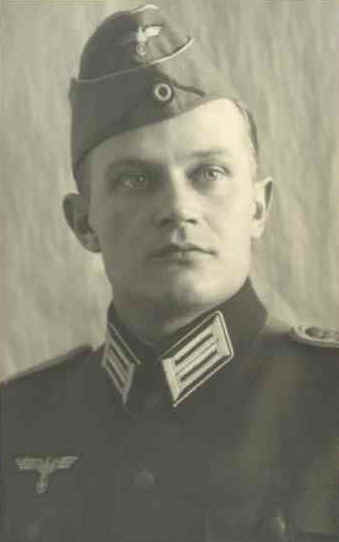 A paymaster Hauptmann-equivalent, for instance, was a Stabzahlmeister; a Major assigned to the Supreme Court Martial was an Amtsrat beim Reichskriegsgericht. Whether the average landser walking down the street would have known the titles is doubtful, but those who worked with these individuals certainly did. Most any soldier would have recognized a paymaster - - he was an important man in the battalion since he doled out food and money. The titles among officials of equal rank also varied by specialty, so knowing the specific title for one Beamter did not necessarily give any indication at all of another's title. Note: graphics on the following table are for illustrative purposes either; each branch had its own secondary colour, and some branches such as Field Post Office had their own insignia in place of the HV symbol. Reich Courts Martial officials wore no devices at all, and army clergy wore no shoulder straps at all! Collar Patches - collar patches varied according to the four categories of career field (See the illustrations below). 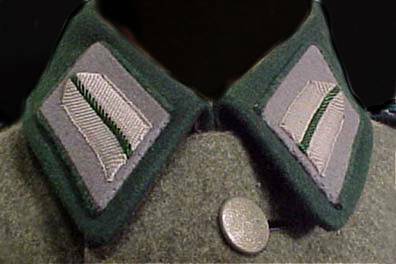 All types of collar patches were rendered on a dark green background, with a border of the Nebenfarbe (secondary colour) on three sides of the patch - top, back, and bottom (ie not along the front of the patch). The four grades were based upon the degree of civil education/trade experience required for the position. For example, the einfacher Dienst required only the completion of grammar school while the hoeherer Dienst generally required a university education. Membership in one of the career fields did not necessarily carry with it a specific rank. Those in the einfacher Dienst bore a rank equivalent to NCOs, those in the upper three categories of career field generally ranked equivalent to company grade officers. Higher grades (ie Stabsoffiziere and above) often were awarded upon the individual's 35th birthday. In some of the specialties of the gehobenen and mittleren Dienste, ranks above Hauptmann-equivalent did not exist. At right, a Beamten showing the collar patches for the Middle and Elevated Services. Note also the officer's pattern field cap (with silver crown and flap piping) and the dark green waffenfarbe soutache above the cockade. Officer equivalents wore gold embroidered collar patches. General equivalents wore a patch identical to Army Generals with two exceptions; the field was dark green, not red, and the patch was piped, like all other Beamten patches, in Nebenfarbe. A patch similar to Army officers, but with dark green waffenfarbe stripes, and nebenfarbe piping, was worn by both these services. While a movement was made to differentiate the insignia of these two categories, it never came to fruition, and both services wore the same type of collar patch, as well as retaining the right to wear the collar patches of the einfacher Dienst on the Feldbluse. Collar patches were of the same size and shape as those worn by Enlisted Men in the Army, though the insignia was generally embroidered in grey artificial silk by hand or machine. The three bars were also grey, and the patch itself was piped on three sides in Nebenfarbe. Sometimes universal pattern Enlisted Men's collar patches with dark green stripes were substituted, but these were piped in Nebenfarbe also. Other uniform details - Beamten generally wore the Army officer's uniform with appropriate insignia. Because they were responsible for purchasing their own clothing, enlisted-equivalent Beamten were also permitted to wear the officer's quality uniform -- this would have included boots and breeches. General officer officials wore general's breeches with the broad red "Besatzstreifen." Officer-equivalent officials wore the breast eagle of aluminium thread/bullion embroidery (gold for generals) while those of the einfacher Dienst wore the enlisted eagle. Headgear conformed to the respective officer versus enlisted patterns with corresponding insignia except that, before its discontinuation in 1942, enlisted-equivalent officials had been permitted to wear the cap known as the "officer's old style field cap" (often called a "crusher" among collectors) with white woven insignia in place of the silver worn by officer-equivalent ranks (those who owned this cap could continue to wear it for the life of the cap even after official discontinuation). Piping on the old style and peaked caps was in dark green, as was the soutache chevron on the M-38. General officer official's caps were piped in gold around the top of the crown and the bottom of the cap band in gold while the upper cap band was in the secondary colour. General's M-38 caps bore gold piping with a dark green soutache. Belts conformed to the same officer/enlisted divisions with generals showing gold-coloured buckles. Officials were not to wear unit insignia (number, cyphers, etc.) on their shoulder boards, nor were they permitted to wear cuff titles other than those that were considered campaign awards (e.g., AFRIKA or KRETA) in "elite" units. Beamten had been permitted the Waffenrock prior to the war's outbreak -- officer-equivalent personnel could also wear the officer's (or general's) brocade belt, dagger, and aiguillette although at one point there was a plan to provide at least a specially-designed dress belt for officials; this never came to fruition. Another category of official was introduced after the outbreak of war; those who lacked the qualifications to be full-fledged officials but who possessed critically-needed skills were appointed as "Beamter auf Kriegsdauer" (Officials for the Duration of the War). Their secondary colour (Nebenfarbe) was light grey for all specialties (to add more confusion, the career fields were the same as the active officials), shoulder board devices were silver coloured, and special collar patches on a light grey background piped in dark green were worn. Hoeherer Dienst Higher Services The special patch in gold on a light grey background piped in dark green with gold stripe. Gehobener Dienst Elevated Services The special patch in silver on a light grey background piped in dark green with dark green stripe. Einfacher Dienst Simple Services The special patch in grey on a light grey background piped in dark green with dark green stripe. Cap bands for officer's caps (both the dress cap and the "crusher"), as well as field blouse and greatcoat collars, and the soutache on the new style field cap, all were to be rendered in blue-grey. This was the same uniform colour worn by the Luftwaffe, and in fact, Luftwaffe basic cloth was supposed to be utilized. Example - the following examples come from the books Uniformen der deutschen Wehrmacht published in April 1939, and The German Army - Men at Arms 320 and give an idea of the complexity of Beamten ranks, titles, and career fields. The following tables are of interest; note that all grades of apothecaries (pharmacists) were part of the hoeherer Dienst, even a Leutnant-equivalent, while a Major-equivalent paymaster (for example) was not. The reason for this is that all pharmacists were university graduates. In general, the Senior Career field had university education as a prerequisite; Advanced and Intermediate were for former Unteroffiziere mit Portepee (senior NCOs) with two years training at service colleges, and the Junior career field was for junior NCOs or men with little training. 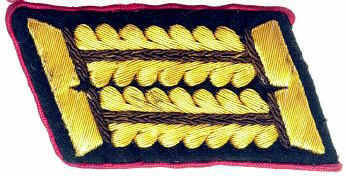 Shoulder boards have yellow line running through the braid in place of dark green.